LRRK2 was immunoprecipitated from HEK293 cells overexpressing wildtype LRRK2, LRRK2 S910A, LRRK2 S935A and LRRK2 S910A + S935A using 5 ug of anti-LRRK2 (100 – 500) antibody per 2 mg of cellular extract. The immunoprecipitates were subjected to SDS-Page and immunoblotted with either anti-FLAG, anti-LRRK2 phospho Ser 910 at 2 ug/ml or anti-LRRK2 phospho Ser 935. Binding of the primary antibody was detected using rabbit peroxidase conjugated anti- sheep IgG antibody (1 in 10, 000 dilution, Pierce) followed by enhanced chemiluminescence (ECL, Amersham). Inhibition of LRRK2 kinase activity leads to dephosphorylation of Ser(910)/Ser(935), disruption of 14-3-3 binding and altered cytoplasmic localization. 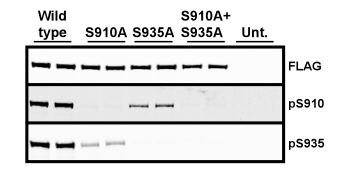 Include the non-phosphorylated form of the peptide immunogen at 10 μg/ml to the diluted antibody.